The massive construction taking over Sochi in preparation for the Olympic games has drawn thousands of workers from all over Russia. But sometimes the sunny city on the Black Sea coast offers more than a desirable job. Aliya Bulavskaya, the industrial safety engineer on the construction site of Sochi’s second-biggest Olympic stadium, always wears a hardhat when she is on the job. But on Oct. 25, 2011, she broke that rule. Instead, she adorned her dark hair with pearls and put on a white gown. It was her wedding day. Standing beside her was the construction site superintendent, Sergei, holding a hardhat several inches above his bride’s head so as not to damage her hairdo. By the time the XXII Winter Olympic Games begin in the Black Sea resort of Sochi in two years’ time, all the roadside drain pipes and ski jumps will be completed, but for the moment, developers, engineers and construction workers from all over Russia are flocking to the city. 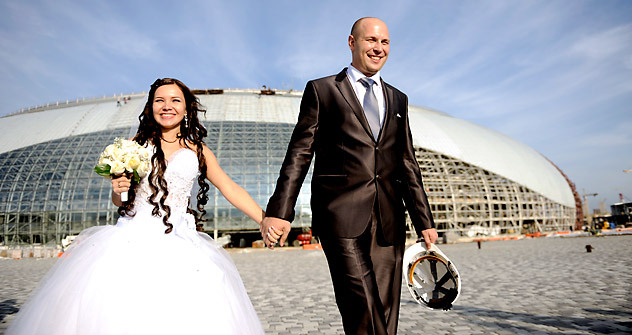 Although Aliya and Sergei Bulavsky were the first couple to have their wedding on the construction site, they are two of more than 800 people who have found their spouses on the location of the future hockey stadium. Two years ago, when Bulavskaya arrived from the Siberian city of Kogalym to the fashionable resort of Sochi, there was only a pit where the future arena was to be. Today, the roof is virtually complete, rising over the sea like the cap of a strange mushroom. The appearance of both the stadium and the city has been changing so fast that time seems to have been compressed. Even experienced Sochi taxi drivers have problems finding the right house numbers. The roads are clogged with trucks. There are traffic jams all along the 62-mile road that runs along the coast linking Sochi’s districts. Russia has high hopes for the Sochi Olympics. At the very least, the games are expected to modernize the infrastructure of the Krasnodar Territory, where Sochi is located. On a recent visit to the city, President Dmitry Medvedev praised the construction that will improve the quality of life in the region long after the Olympics are over. Medvedev brushed aside the naysayers who predict that after the Games, the new hotels and sporting facilities will stand empty. One topic the president has carefully avoided was the cost of preparing the city for the Olympics. Business daily Vedomosti has been tracking the numbers, however, and reported that state-owned gas monopoly Gazprom now plans to invest more than $3.3 billion in the Olympic construction. Providing security at the games will cost $1.8 billion – twice as much as during the Vancouver Winter Olympics in 2010. The huge construction site has scared away many of the tourists who once flocked to Sochi’s beaches, but even so, the area around Sochi is making money. In Krasnodar Territory, the gross regional product increased by 5.4 percent last year and by 6.3 percent in the neighboring Rostov Region, making these regions the fastest growing in Russia. For Aliya and Sergei Bulavsky, the Olympic project is the best thing that could have happened to them. Aliya, 27, joined the project right after she graduated from university. Although she initially had trouble commanding respect from the workers, she quickly found an ally in Sergei. He set an example by always wearing his hardhat and made sure the workers only smoked in designated smoking areas. But soon the Olympic dream will be over for the Bulavskys. The hokcy stadium must be done by May. By February 2014, when hockey teams from all over the world will be going for the gold, Aliya and Sergei will be working on another construction site. Their employer has major projects all over Russia. “We’ll go and build wherever they send us,” said Aliya.